Velehrad is one of the most important places of pilgrimage in Moravia. Its history started more than 800 years ago. The first twelve Cistercian monks came to the valley of stream Salaška to build up their convent not far from village Veligrad (today it is Staré Město). The founders of the monastery were Přemysl Otakar I. - the king of Bohemia and Vladislav Jinřich - the Moravian margrave with the participation of Robert - the Bishop of Olomouc. This gives Velehrad a royal majesty. However, thanks to its position Velehrad retains primarily memory of Ss Cyril and Methodius evangelism of Great Moravia, the beginning of Slavic literature and culture in general. It carries the mission to be the intersection of Nations and meeting place of Eastern and Western Christianity. The foundations of today´s ecumenism were laid through the Unionist Congresses in the twentieth century. Velehrad became a place to fight for the human right to religious freedom ( National pilgrimage in 1985). The importance of Velehrad was emphasized by Pope John Paul II. He declared Ss Cyril and Methodius common patrons of Europe in 1980 and Velehrad was the first place he visited after the fall of communism in 1990. Velehrad is connected with a number of outstanding personalities. Among them we can highlight the Olomouc Archbishop A.C. Stojan and Cardinal Tomáš Špidlík who are burried in basilika in Velehrad. We come here to touch our spiritual as well as national roots in internalized way and perceive our European identity. Information centre is situated in The Velehrad house of Ss Cyril and Methodius which was renovated from former farm buildings (Granary and the Stables) of Velehrad monastery in 2010 – 2011. You can find it at a major crossroads in the village Velehrad. Is the main dominant of this place of pilgrimage Velehrad. In 13th century it was a Romanesque and Gothic building then rebuilt in the early Baroque style. Stojanovo gymnázium (grammar school) and Vincentinum (Social care institute) is housed in convent complex. We can see the Slavic hall and the lounge called Salla terrena with Baroque frescoes. The church Relevation of the Lord-“Cyrilka"
It is a small church built in 13th century for inhabitants living nearby the monastery. It became dilapidated in 19th century and was restored in Neo-Gothic style on the occasion of the Cyril and Methodius anniversary in 1863. In 1929 the iconostasis was installed here for the possibility of serving the Eastern Liturgy. Former farm buildings (Granary, the Stables) were reconstructed and are accessible in the form of the services that are provided here. (an information centre, a museum, a café, a bookstore). In the immediate vicinity of the monastery there are Chapel of St. Vendelín with the statue of this saint from F. Hirnl, Baroque Marian Column, sculptures of St. Bernard and St. Luitgarda from O. Schveigel, Chapel of Jan Nepomuk from 1715 nearby the Baroque bridge over the river Salaška, statues of Jan Nepomuk along the road to the cemetery and on the municipal square, statue of the Son of God at the crossroads between Velehrad and Modrá (possibility of free individual tours). This is a place where many important personalities are buried, for example Mons. Jan Šrámek, Cistercians from Velehrad, slavist Jan Vašica, nuns of the Order of Ss. Cyril and Methodius and nuns of the Order of the Divine Redeemer, members of the Jesuit order, etc. 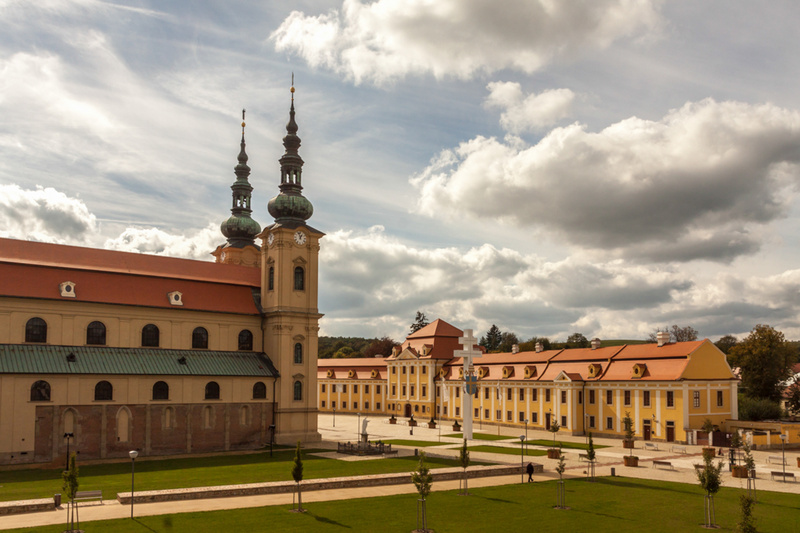 The foundations of the original Cistercian monastery from the 13th century, lapidarium (collection of mostly late-Romanesque architectural pieces) and baroque crypt are located in areas under the basilica and the current monastic buildings. This place has been available to the public since 1937. Now a new exhibition is starting: “Velehrad at the intersections of European history. This pilgimage route with twenty stone stations connects Velehrad and former Veligrad - Staré Město. It is built along the bike path connecting these two places.